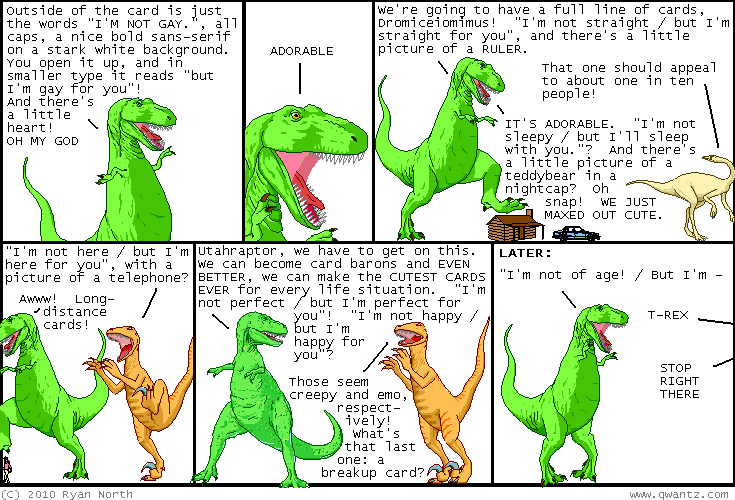 Dinosaur Comics - September 10th, 2010 - awesome fun times! –At its core, it refers to a control system that adjusts itself to feedback! September 10th, 2010: Remember yesterday when I said we should beat IBM, a multinational company with huge resources, the second-most valuable global brand after Coca-Cola? SO UH, WE BEAT THEM IN LESS THAN DAY. Amazing! We're now the sixth largest team on the network. Even the World Community Grid itself has noticed our unstoppable ways! Excellent work, everyone! I said yesterday that I'd cool it on issuing challenges for a while, but I'll just point out that to move up to number 5, we have to take down EasyNews, who has almost twice the members we do. So we're going to do this one stealthy-like. The link to join is here, and it's also beneath the comic in the "Big ups and shouts out" section. If you're reading this, it's likely you're on a desktop or laptop computer, and that computer can help cure cancer and do all sorts of excellent humanitarian computing in its spare time. Yesterday alone we did over a year and a half's worth of such computing in a single day. Join us?